A ghostly visitor with a shocking secret, a daughter devastated by loss, a deadly duel – and the most famous question in all of drama. Just some of the reasons why Shakespeare’s iconic tragedy will hold you spellbound. Produced with the generous participation of: Laura Dinner and Richard Rooney, The Jenkins Family Foundation, The Henry White Kinnear Foundation, Ophelia and Mike Lazaridis, Jim and Sandra Pitblado, The Slaight Family Foundation, Robert and Jacqueline Sperandio. Jonathan Goad (left) as Hamlet and Geraint Wyn Davies as Claudius in Hamlet. From left: Mike Shara as Laertes, Tom Rooney as Polonius and Adrienne Gould as Ophelia in Hamlet. Photography by David Hou. Adrienne Gould as Ophelia and Jonathan Goad as Hamlet in Hamlet. Seana McKenna as Gertrude and Jonathan Goad as Hamlet in Hamlet. Jonathan Goad as Hamlet in Hamlet. Photography by David Hou. Members of the company in Hamlet. Photography by David Hou. Tim Campbell as Horatio in Hamlet. Photography by David Hou. Jonathan Goad (left) as Hamlet and Tim Campbell as Horatio in Hamlet. Jonathan Goad as Hamlet with members of the company in Hamlet. Photography by David Hou. 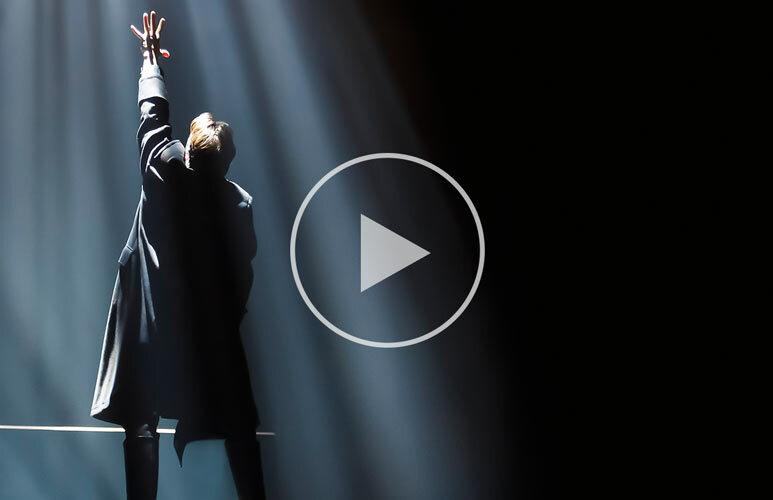 "Exciting from start to finish"
"The most complete, most fulfilling, most satisfying production of Hamlet in decades"
Watch Hamlet On Demand Now!